There are so many seeds and items to grow in the classroom! 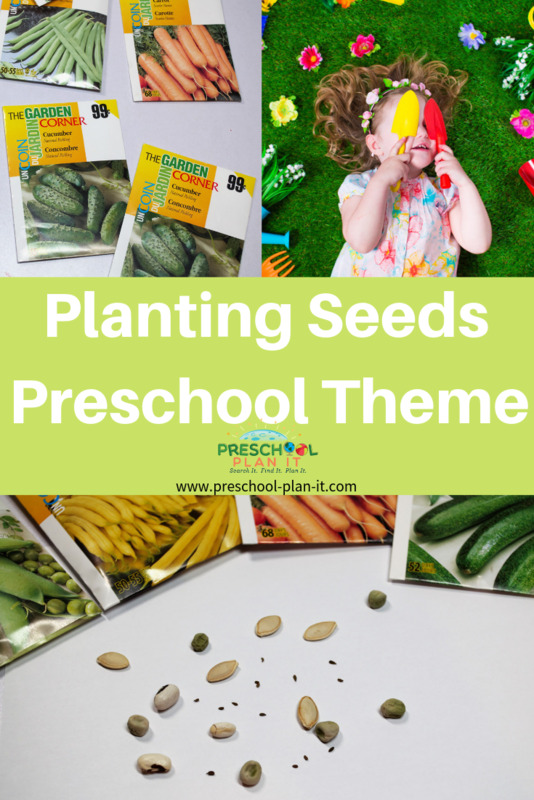 This Planting Seeds Theme page is filled with preschool activities and ideas for all areas of your classroom. They then glue rolled up pieces of tissue paper or actual seeds into their "hands". This is a follow up to The Tiny Seed story. Extension: Let the children create their own art work by placing the seeds where they want for a very creative design! They can place them on the contact paper or glue them onto paper! Materials: Provide hollow blocks (or other blocks) and small, plastic wheelbarrows for the children to move their plants (blocks) to the shelves. Explain what wheelbarrows are used for during planting or gardening. In advance, make 5 daffodils from paper, laminate and place velcro or a piece of a dryer sheet on the back so that it sticks on your flannel board. Up popped another one and then there were two. Up popped another one and then there were four. Up popped another one and then there were five. They danced in the breeze wearing green satin gowns! EXTENSION: Pause before saying each number for the children to have time to count and recall the next number. Ex: then there were........right! 3! EXTENSION: Bring actual daffodils to school and place them in your science area. 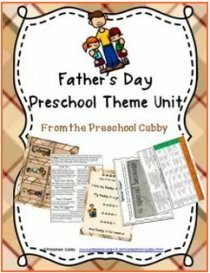 The children can explore them while recalling this poem! Materials: In advance, make flannel pieces to go along with this book. You'll need a little boy, mother, father, brother, a tiny seed, a carrot top, a wheelbarrow a watering can and a huge carrot. Use these materials while telling the story. VARIATION: Give each child one flannel piece to add to the board as you read it. You may need to read the story twice this day so that each child has a turn! Write a cooperative story. After discussing what seeds need to grow, start a story with them. 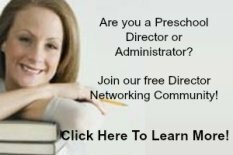 Tell them they are going to help make up a story about a seed! "So, our seed was dug up by the turtle and the bird took the turtle and the seed in the air. What happened next?" Then go on to ask the next child. These stories are SO much fun to read back to them each day! And to photo copy and send home with them for their families to enjoy! Snack Recipe Ideas for Your Planting Seeds Theme! Cooking with children helps develop their math skills and helps them to learn how to follow directions. It also allows for some great conversation! Ask many questions while cooking with your children to encourage conversation! Be sure to ask specific theme related questions while making these fun snacks! If you have read From Seed to Pear for this planting seeds theme, have a pear tasting party! Ingredients and Items Needed: Yellow and green pears, knife, chart for recording the children's likes/dislikes. For the chart, draw 3 columns. Draw a picture of the yellow pear on top of the second column and a picture of the green pear on the top of the third column. List each child's name in the first column. As each child tries a piece of each pear, write the words yes or now under each pear based on if they liked it or not. These charts can be set up in many ways. You could also write each child's name on two pieces of paper. On the chart, the children place their name under the pear only if they like it. 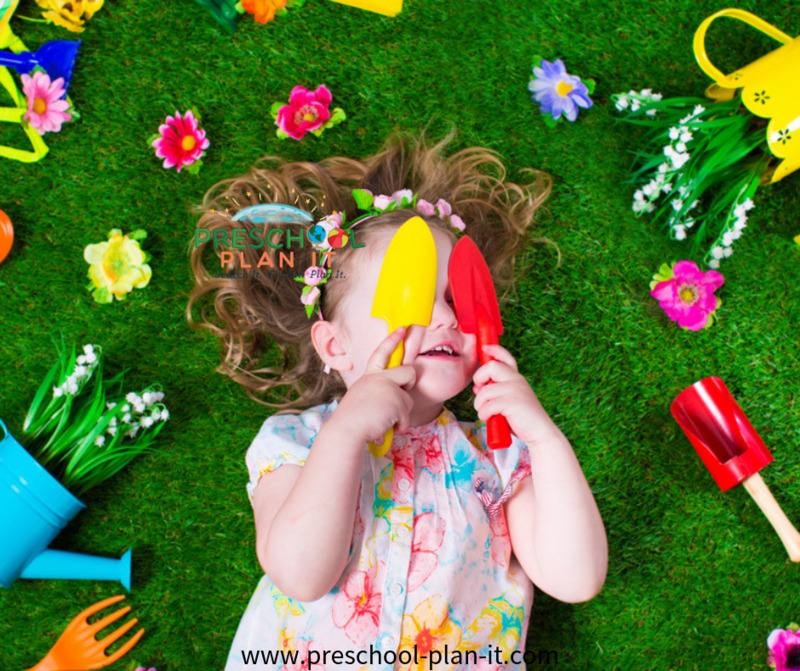 Provide hats, gardening gloves, aprons and plastic planting tools (such as pails, shovels, hoes, watering cans); artifical grass and moss; bandanas; overalls to dress up in, for the children to plant in dramatic play! Materials Needed: Mix some small seeds (like marigold or other small and thin seeds) into the paint for a different texture! Do your children like the Duck, Duck, Goose game? Replace the words with Seed, Seed, Grow to compliment your theme! 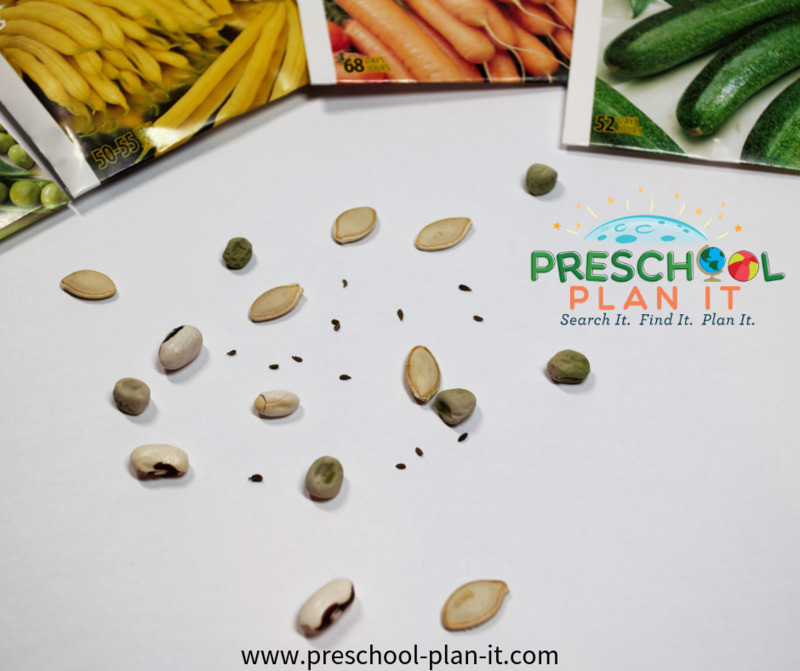 Planting Seeds Math Activities to Help Your Preschoolers Develop Their Math Skills AND the Small Muscles in Their Hands! 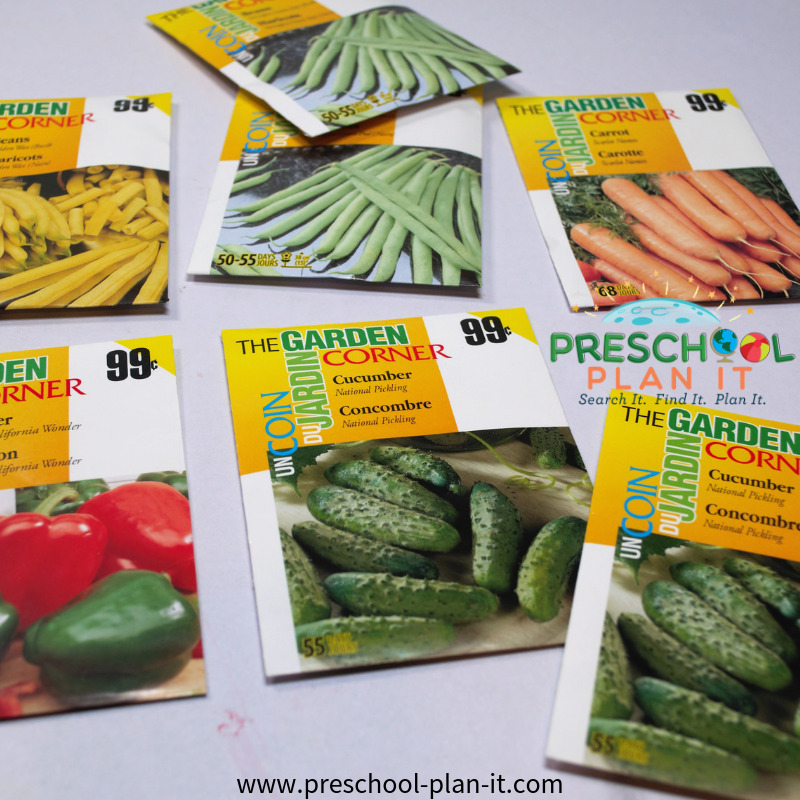 Materials Needed: Save the seed packets that you used for the seed activities in this unit. Laminate them (be sure to have 2 of each type). Place them out for the children to match. 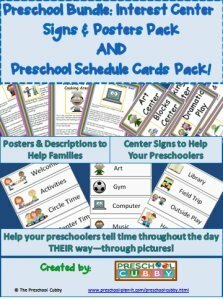 Use as a memory or concentration type game as well! 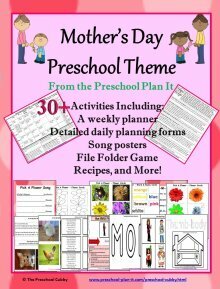 Planting Seeds Theme Music & Movement Ideas to Get Your Preschoolers Movin' and Groovin'! Have the children squat down and pretend they are little seeds. Play some calming music. As you turn the volume up slowly on the CD player, describe what is happening to "them"--the seeds. They should try to act this out! The seeds are in the ground nice and warm. It is raining and they are getting a drink. The sun is warming them and help them grow! The seed is opening and roots are coming out! It is raining again! There's the sun! Oooh, the plants are coming out of the ground! Add potting soil and lots of seeds to your sensory table for your students to explore. At the end of the week, transfer the soil and seed mix to another bin and water. Place this in your science table for your children to care for and watch the seeds grow! Materials: ziplock baggies, paper towels, spray water bottle, lima beans, markers. Children spray their paper towels with water. They place 3 lima beans in the middle of their paper towel. Help them to fold the paper towel over the beans. They place that into a ziplock baggie. Write their name with marker on the outside of the baggie. Tape baggies to a sunny window and watch them for a week or two until they sprout! NOTE: Once you open the baggies, they will smell terrible! Be prepared! Although this is an experiment that you may be bored with, remember that your children have never seen it before! Place a different color of food coloring in each cup of water. Place one celery stalk in each cup, with the greens at the top. The children learn how root systems "drink" water from the bottom and bring it to the top. NOTE: We used blue and red food coloring. The interesting thing was that after a couple of weeks, the blue one still looked blue and ok, but the red one actually began wilting and turning brown...I guess there is something to that whole fear of red dye...it was proven to us with this experiment! 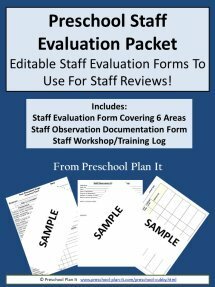 Provide the children with a piece of white construction paper and a white crayon. Encourage them to draw different sized seeds and what their seeds will grow. Have the children paint over their picture with watered down brown tempura paint. It will not stick to their crayon drawings. 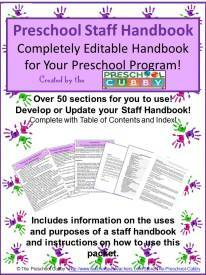 VARIATION: Have the children print their name or other letters you may be working on with them. If the white on white is too frustrating for them, provide a color they can see to use on the white paper. It will still amaze the kids that the paint won't stick to their letters!